The Podenco Canario, belongs to the family of primitive sighthounds found throughout the Mediterranean. It includes the Cirneco dell’Etna, Ibizan Hound, Pharaoh Hound, and the Portuguese Podengos. The term ‘sighthound’ is a bit misleading as the Podenco Canario uses sight, scent, and hearing while hunting. Much of its homeland is an uneven volcanic terrain, and it is adept at locating hidden prey in rock crevices and thorny bushes. The Podenco Canario’s main prey is rabbit and hare, although it can be used for any small game. The Podenco Canario is an ancient breed that is found throughout the Canary Islands, particularly on Gran Canary and Tenerife. Like the other Mediterranean sighthounds it is unknown how or when they arrived on the islands, but the most commonly held theory being that they were traded throughout the region by the Phoenicians. If true, their ancestors were likely Egyptian hunting dogs, such as the Tesem. It is known that the Podenco Canario was already established on the Canary Islands before they were discovered by Spain in the 15th century. They were bred and kept by the native Gaunche, whose own arrival onto the island is unknown. Although not a popular theory, the Gaunche themselves may have brought sighthounds with them when they first inhabited the island. 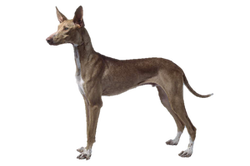 Today the Podenco Canario is an extremely rare breed and is not often seen. However, it does retain Fédération Cynologique Internationale (FCI) recognition. Is the Podenco Canario Right for You?